The Annual for August was a bit of a poser: a style for producing colourful maps for a science-fiction game. The actual artwork in the style came from the High Space game published by Storyweaver games. Lovely artwork, but how to turn that into a map for my Tolrendor fantasy world (i.e. the main purpose of the Challenge!). Well, back in the day, there was Spelljammer, an innovative setting for AD&D, taking your adventurers into a fantasy outer space, or Wildspace. Here the ‘science’ was based on magic and owed more to steampunk concepts than sci-fi, but incredibly cool all the same. The setting didn’t make it into the 4E rules, which I always thought a shame, as the cinematic mechanics would have suited Spelljammer adventures pretty well! 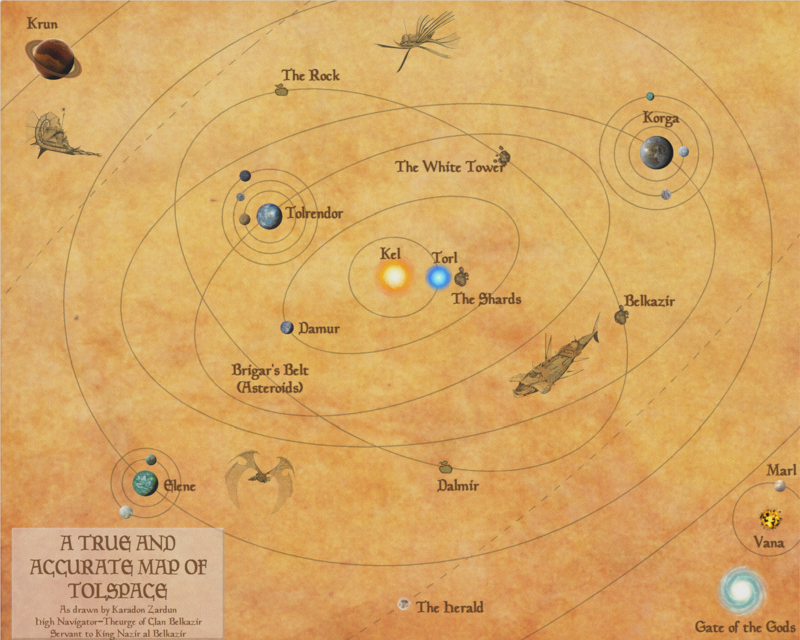 Being a fantasy ‘space’ map, it didn’t seem right to use any of the fantastic star-system backgrounds from the style, so I used the planet artwork, but on a parchment background. I also scanned and photo-shopped some of the original Spelljammer ship artwork (copyright TSR/WOTC of course …) for extra interest.